We watch champion’s win all the time, but rarely do we get a chance to see what is going on inside their head. 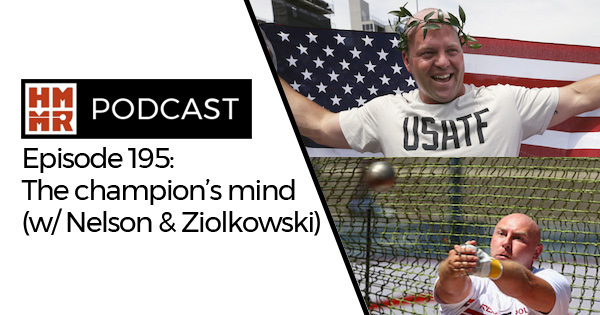 On this week’s episode we get to talk to two Olympic champions and see what their thought process is in competition, how they prepare, and how they’ve overcome some of the most difficult situations imaginable in sport. Tune in to hear shot putter Adam Nelson and hammer throw Szymon Ziolkowski share their experiences. Adam Nelson and Szymon Ziolkowski are two of the greatest throwers of all time. Nelson won the 2004 Olympics and 2005 World Championships, in addition to medals at the 2000 Olympics and three more world championships. Ziolkowski was the 2000 Olympic champion and 2001 World Champion. He continued to collect medals until the 2012 European Championships. On this episode they both reflect on their mental preparation and walk us through a competition from their perspective. 10:45 – A look behind Nelson’s routine and how it started. 13:30 – Integrating visualization into the routine and defining triggers. 15:15 – Learning about sports psychology. 18:30 – Refining visualization skills and triggers: “Usually when we see stuff inside our head we don’t see it in first person. We tried to see that super-human person in every scenario imaginable until at some point you find yourself staring in the mirror and you are that person you’ve been describing. 23:45 – The mental side of longevity and grit. 29:30 – Internal vs. external motivation. 40:00 – Approaching the first throw after falling and his coach’s input. 45:15 – Goals for Sydney and competition strategy. 47:30 – Dissecting the fall. 49:15 – Being an underdog. To hear more on these topics, listen to the full episode above. Also be sure to subscribe to our podcast and review it on iTunes. Join HMMR Plus so you don’t miss all the content on our site, including past episodes of the podcast, our deep article archives, video library, and more. If you like the podcast, don’t miss our latest book Training Talk: Conversations with a Dozen Master Coaches for more in-depth insights on training from some of the world’s top coaches. This month’s site theme is mental training. For more on the topic listen to last week’s episode on mental skills with Mona Pretorius or read our recent articles on dealing with fear, mental toughness and mountaineering, and real life lessons from Sergej Litvinov. For more on Ziolkowski’s story at the 2000 Olympics, you can also read our article from last week. A picture is worth a 1000 words. You have to watch the video of Nelson’s pre-throw routine and Ziolkowski’s epic fall. Both guests have been on the podcast before. Ziolkowski was a guest on Episode 122 and Nelson was a guest on Episode 42. We also did a written interview with Nelson in 2012. Throwers might also like to explore our March theme on throwing.